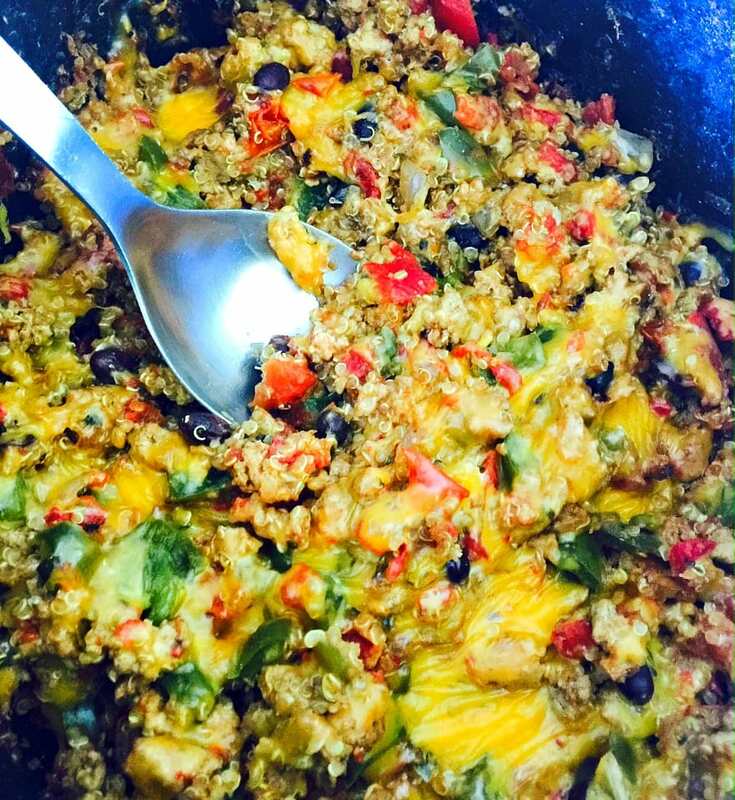 This 21 Day Fix Quinoa Taco Casserole uses tons of veggies, quinoa, and ground turkey to make a simple and delicious meal. Use either the Crock Pot or Instant Pot, for the perfect lunch or weeknight dinner! Confession #86 – I’m getting a little anxious about the start summer. Which is crazy. I have always looked forward to being home in the summer, especially since I was able to pull my kids out of daycare and spend two glorious months pretending to be a stay at home mom. We all loved it. Now that I am officially a stay at home mom, I should be even happier about summer starting…but I was spoiled this year with my daughter in pm kindergarten. I had the best of both worlds, you see. We were able to spend all morning together, but everyday at 12:30, my daughter went to school and I was able to put my son down for his rest time. And therefore I had some sanity. For about an hour or two a day. This, people, will exist no more. And trying to convince my 6 year old that we need to leave the pool, playdate, or park NOW to keep my son’s rest schedule in tact will be no treat. 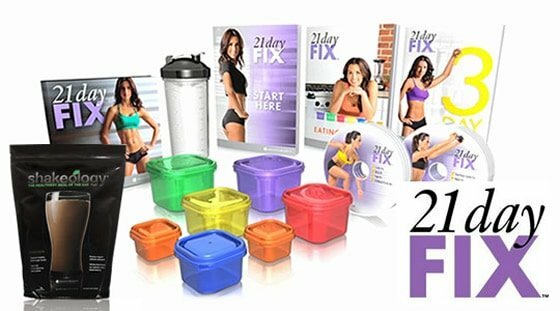 Stay at home moms – any advice for me? Anyway, while I typically think of winter being crock pot season, I envision using my crock pot a ton this summer for quick and easy meals to help me through the chaos. And it’s easy to put a summer spin on them. 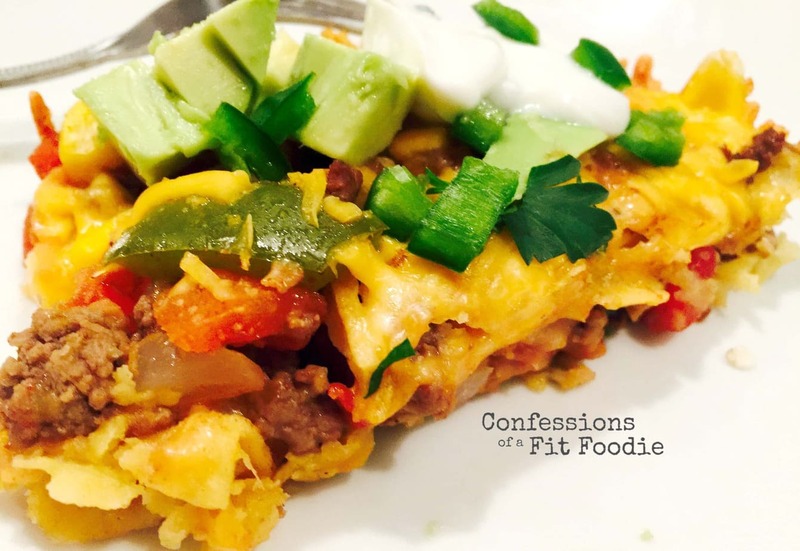 Like this Crock Pot Quinoa Taco Casserole. Delicious on it’s own, it feels a little more summer-ish served in a lettuce wrap with a bit of fresh lime. Yum! This is super simple (you don’t even need to cook the quinoa first!!) 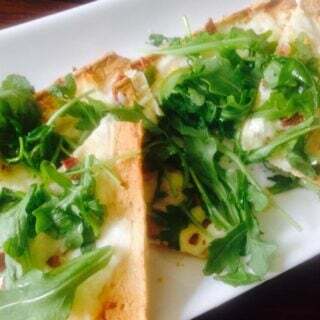 and perfect for lunch or even dinner throughout the week. Give it a try and let me know what you think! 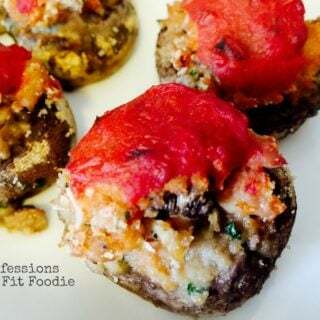 **I recently updated this recipe with Instant Pot directions! Easy just got even easier! 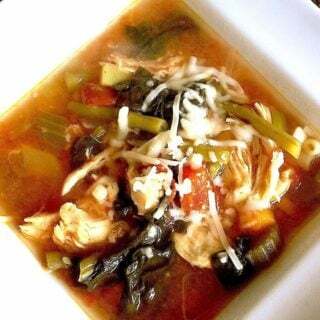 Crock Pot: Place all the ingredients in the crock pot and cook on high 3 1/2 hours or on low for 6-8 hours. Taste and adjust seasonings, adding a sprinkle of salt and pepper, if desired. For the last half hour, add cheese and allow to melt. Serve alone, or as a taco filling. 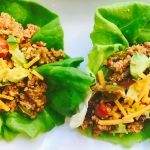 I used lettuce wraps for extra green and topped with a squeeze of fresh lime and a bit more shredded cheese. Yum! Instant Pot: Turn Instant Pot to saute and brown ground turkey. Once it’s cooked through, add in veggies and saute for an additional minute. 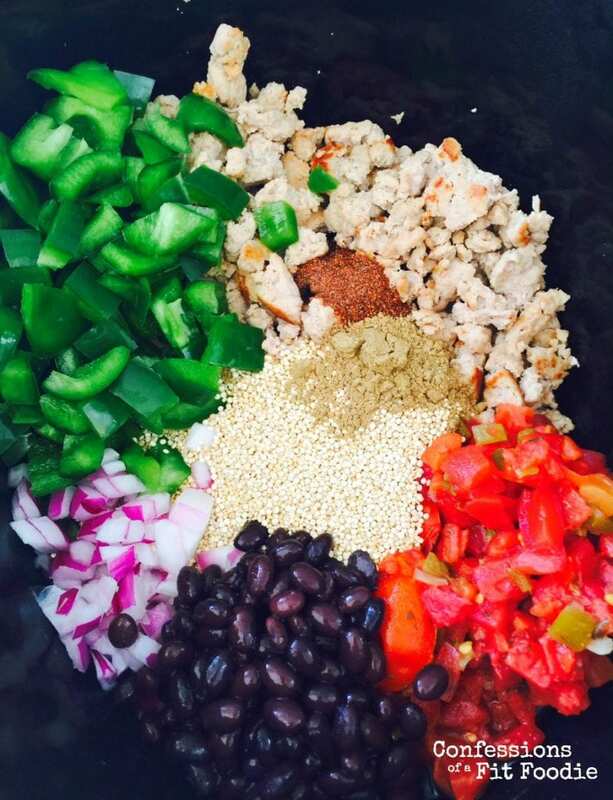 Stir in quinoa, beans, tomatoes, broth and seasoning. Set to manual for 4 minutes, then let steam release naturally. Once you can safely open the pot, top with cheese and place the cover back on to melt it. Serve alone, or as a taco filling. 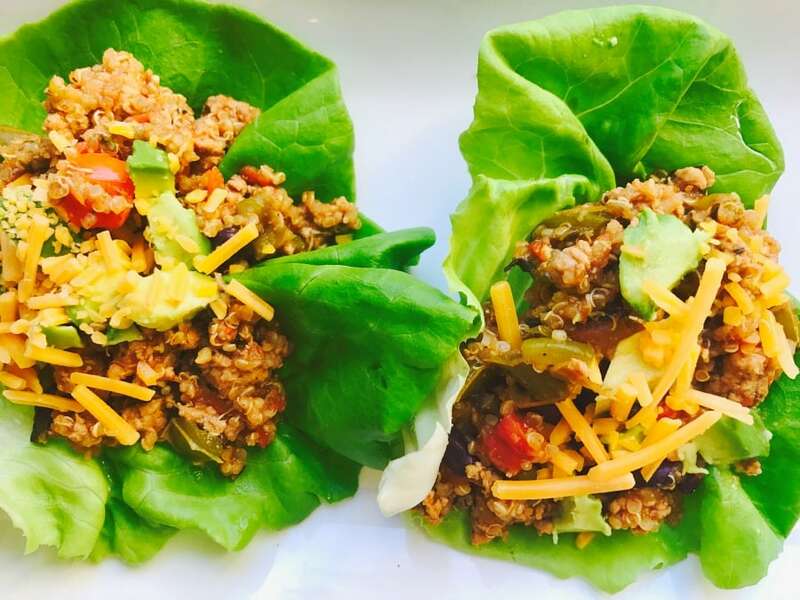 I used lettuce wraps for extra green and topped with a squeeze of fresh lime and a bit more shredded cheese. Yum! 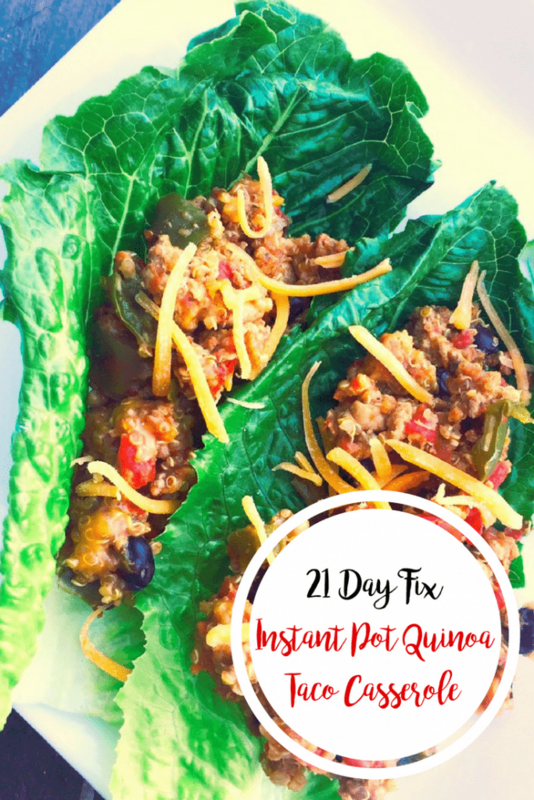 I have a reciepe for quinoa chicken enchilada casserrole it is a 21 day fix recipe. For this recipe, you just put it in raw. If you want to make the quinoa, just follow the instructions on the box or bag, but be sure to rinse it first! It can taste bitter if you don’t rinse it! Hope that helps 🙂 My quinoa has the following instructions – The ratio is 1 cup of uncooked quinoa to 2 cups of liquid. Bring quinoa and liquid to a boil in a medium saucepan. Reduce heat to low, cover and simmer until tender and most of the liquid has been absorbed, 15 to 20 minutes. Fluff with a fork. Please disregard my comment… I purchased a different brand of cups, and the purple for it is proteins. I was so worried that I had missed counting the protein. I had a question for when you make serving what container did you use to measure? How large is the serving size? One cup? 2 cups? I can’t quite eyeball 1/4th of the whole thing. I usually portion it out before serving. I would say about 1 – 1 1/4 cups. I can’t have dairy products. Do you think you could make this without adding cheese into the slow cooker? Otherwise it sounds great! I do! It will have a different flavor, but still very yummy! Do you have to sauté the ground meet first or could I cok in the crock pot? I am not a huge fan of the texture of ground meat in a Crock Pot unless it is browned first. That being said, you the meat will cook through in the crock if you put it in raw. Black beans and quinoa are place in cooker uncooked right?? Thank you. I’ll try it today ? Is this recipe spicy?? I noticed the green chilis and wanted to ask. Are the black beans canned or dry? Can you use chicken breasts in this recipe instead of ground and just shred it up at the end of cooking? That should work! Let us know if you try it! How do I figure out the nutritional count if you aren’t following the colors? 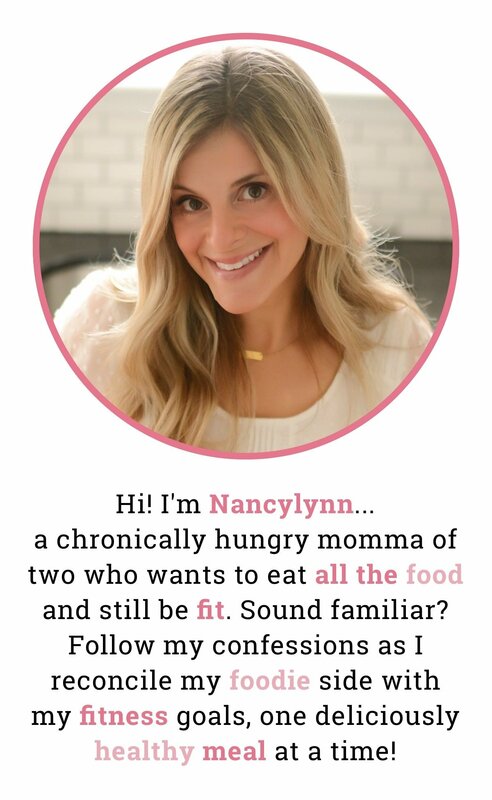 Have you ever used myfitnesspal? It’s super helpful for this! Are the portions the same for containers if you double the recipe? I just doubled everything and put it in crockpot , will the containers be the same each serving ? Yes, but you need to portion 8 servings. Make sense? As long as you keep the portion size, then yes! Hi! I just made this and you’re saying that it serves 4 but I divided it using the green container ,3/4 but got 8 eervings. Did I measure wrong? I am eating this right now for lunch and it is delish! I am having it over shredded lettuce with avacado and green onions. Looking forward to enjoying the leftovers!! This is my first instapot attempt! When you say set the pot to manual for 4 minutes, do you mean set instapot to pressure cook? Hopefully, bc that’s what I just did…i dont see a manual button.